Danat Al Emarat Hospital for Women and Children in Abu Dhabi welcomed a total of 6 newborns (5 boys and 1 girl) on Arafat Day, and another 4 newborns (2 boys and 2 girls) the first few hours of Eid Al Adha. 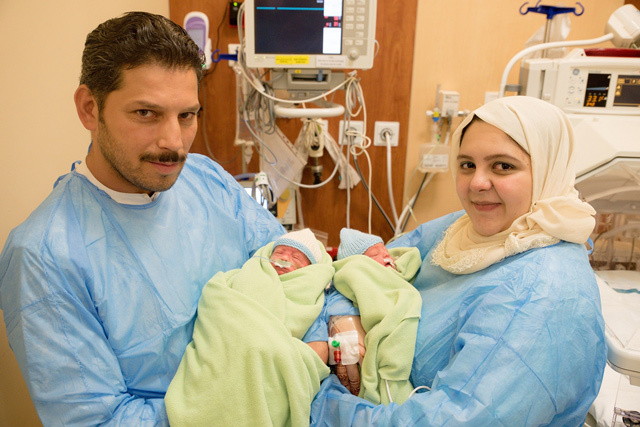 The twins were delivered by Dr Rihan Saafan, Consultant Obstetrics & Gynecology at Danat Al Emarat Hospital. Dr Rihan said, “Multiple pregnancies are associated with higher possibility of early delivery. The twins were due in the third week of October but decided to join the family on this special occasion for all and triple the joy of their parents and ours. Both babies and mother are in good health." “Including our 10 newborns, 4445 babies have been born at our hospital since we opened in October 2015; including 2313 boys and 2132 girls; of which 2775 were UAE Nationals. All these precious bundles of joy were managed by our 70 medical team members of obstetricians, pediatricians and neonatologists. We expect to welcome another 4 babies by the end of today," she added.